The Intellistation ™ is the latest development in the CANTAB Cognitive Testing system for non-human primates. It retains all the test specific criteria, stimulus presentation, and animal response hardware of all past systems. The heavy umbilical cable that limited the distance between the test station and central controller has been eliminated and the central control as well. Each test station now houses an Intel ® based 1.6 GHz CPU. Connect an optional keyboard, monitor, and mouse directly to the test station and it can be run as a totally independent product without the expensive multi port interface previously used. Remote operation of single or multi station applications is possible by simply connecting the test stations with a standard Ethernet cable. Either set up a small network for the test lab only or tie into an existing network. Optional packages are available to help with these configurations as needed. The CANTAB and WhiskerServer software license is now sold per station to keep the startup cost even lower. The model 80951A Intellistation ™ features Liquid-based reward as favored by users working with Marmoset monkeys, but can still be used by anyone working with other non-human primates. If a system with both pellet and liquid reward is needed, start first with the 80950A Pellet Reward unit and add one of the optional lick tubes. Features of this unit include the touch screen panel encased by a heavy duty metal frame / enclosure with a fixed response lever, a calibrated peristaltic pump with 12.2 ml/min flow rate, and receptacle. 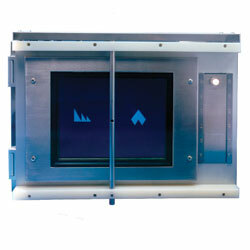 The 14.875 inch (37.78 cm) diagonal response area features a toughened splash proof IR touch-screen with LCD monitor. To the side is a house / signal light, reward area with tray report feed by the peristaltic pump and a response lever. All components are mounted in a robust stainless steel enclosure that measures 22 in W x 15 in H x 12 in D (56 x 38 x 30 cm) and weighs approximately 50 lbs (22.5kg). There are hinged stainless steel side panels with latches that can not be opened by an animal to access the feeder and other components. Line Voltage 115/230 VAC 60/50 Hz. Specify 80951*C for 230 VAC 50 Hz with country specific power cord. Test Station for the Cambridge Neurological Test Automated Battery equipped with Pellet Reward. A flat display and touch screen with signal light and speakers. This style of unit, first designed for use with dogs, has since been used with primates and swine.